Interestingly, I've passed Jalan Ceylon numerous times, but seem to have missed this Italian restaurant until recently where I had the opportunity to dine there for lunch courtesy of the good folks from The Entertainer. Nerovivo Italian Restaurant is located just next to Bijan Bar & Restaurant along the busy road of Jalan Ceylon. For starters we were served with the delectable looking Beef Carpaccio. I've developed a taste for this dish ever since I was introduced to it a couple of moons ago. Back then, it very new to me, this raw beef dish. Served with rocket salad, shaved grana padano roasted pine nuts, the raw beef had a resfreshing taste to it, thanks partially to the citronette dressing too. Don't get me started on the Italian names of all these dishes, as I encountered problems tying back the photos to the correct name. Anyway above is the Caprese (V) if I'm not mistaken, another refreshing starter dish. The dish consists of mozarella, roman tomatoes and fresh basil served with rocket salad dressed with balsamic vinegar extra virgin olive oil. Simple, yet refreshingly tasty, whetting our appetite for more Italian styled dishes to come. The Linguine Al Granchio pasta dish came served in a rather interesting presentation, with a lovely looking crab sitting atop the spaghetti. The crab meat added flavour to the otherwise very 'tomato' flavoured dish. The linguine pasta was springy, and went well with the cherry tomato and white wine sauce. I've always been a fan of the Spaghetti Carbonara dish no matter where I dine at, as I do love the creamy and cheesy sauce that it comes with. Here at Nerovivo, the spaghetti Carbonara had to be one of my favourite dish that afternoon, served with generous amounts of beef bacon, and parmigiano. It's a pity the pricing is a tad too high for my liking, but I guess that's to be expected of an Italian restaurant such as this. The main dishes were next, the Scottaditto Di Agnello which was basically pan roasted lamb chops, with oven baked potatoes, and mix salad served with red wine sauce. Don't ask me why I did not feel it was roasted at all, more like being deep fried. It did taste good though, especially with the crispy crumbs coating the meat. Two pieces of the lamb wasn't enough. Don't get me wrong, I love my steaks, and ordered the rib eye steak that afternoon. When it was served however, I felt it tasted more like tenderloin, and not the usual fatty piece which I love. The steak does look good though, and went well with the accompanying sauce. I think it's tenderloin, anyway the roasted potatoes under the steak had this distinctive flavour that I like, being savoury with a slight tinge of sweetness. We ended our wonderful lunch binge at Nerovivo Italian Restaurant with sweet desserts and ice-cream. Their dessert platter is for sharing, and comes with seven of their signature sweet desserts ranging from creme brule, tiramisu, panna cotta, chocolate mouse and many more. So if you're on a look out for some nice Italian dishes in KL, do drop by Nerovivo, as they have their lunch set menu which is more value for money. "Introducing the book version, as well as the mobile app, I was pretty impressed by the numerous 'buy 1 free 1' offers in the book. 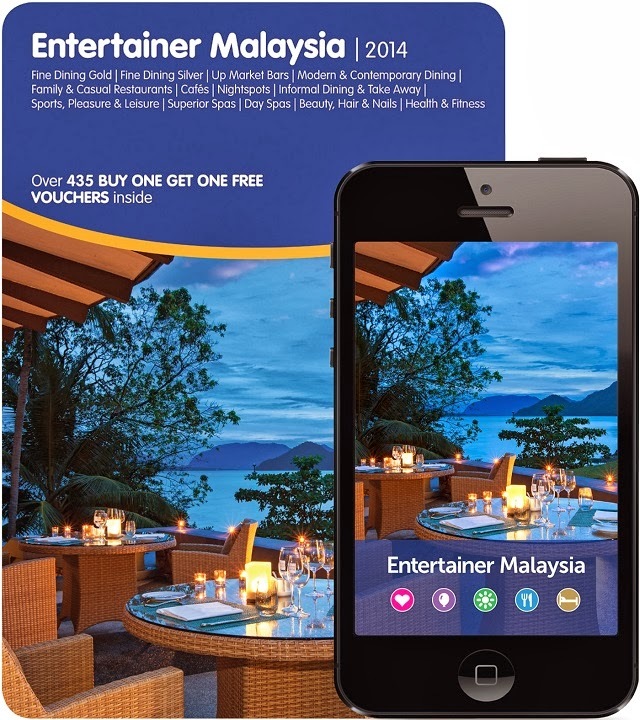 Described as “Buy One Get One Free” incentive vouchers, The Entertainer marked its entry in Malaysia with a stellar list of over 825 offers from the city’s exclusive dining, leisure, wellness and entertainment venues. Included in this are also over 380 exclusive offers for Malaysia’s leading hotels such as Intercontinental Hotel Kuala Lumpur as well as relaxing propositions at The Slimming Sanctuary and Sothy’s." WHY THE CRAB LINGUINE LOOK SO CUTE WAN! I’m really disappointed and totally not happy; I can say it was the worst experience I had with any restaurant not because of the food but due to a lousy and bad management skills by the restaurant’s manager called (Hafiez, I guess from Bangladesh or Sri Lanka) On the May 25th 2014, we went to Nerovivo (at changkat, bukit bintang –Kuala Lumpur) for lunch. What happened is, we mistakenly printed out the wrong voucher that we bought online for the meal (got it from Groupon),so when we showed up for the lunch, the waiter asked to show the voucher we did not have as we mistakenly printed another restaurant voucher, so we asked to speak to the manager and when he came we told him the story and we showed him the email and voucher on the phone and we asked him to help printing it or to accept sending it to via email, but he insisted that we have to show the hard copy or leave, and he added the office is closed and he does not have the key ( Wow a manager without a lil power or access to do anything in his job, add to that the way he said it , was F*** rude and almost kicking us out, in addition, F*** poor problem solving skills ). I ended up walking down the street on a hot and sunny day to an internet café to print out the F*** voucher… I rather die of hunger then going to Nerovivo Restaurant in KL because of the worst manager ever called Hafiz. Asid to Hafiz: be a manager not just a waiter with different uniform. Aside to the owner of Nerovivo KL: You just lost potential loyal customers. If United breaks guitars then Nerovivo kick out customers.